- Behind-the-scenes "The men behind the army"
Bruce Campbell is back as Ash in Evil Dead 3. This is the funniest of the Evil Dead films, and on this Limited Edition you will find both the Theatrical cut and the Directors cut. I started by watching the Theatrical cut, then the documantary and finally the Directors cut. After that i looked at the trailer and the deleted scenes. The theatrical cut is 15 minutes shorter than the DC, and has audio in DD.5.1, while the DC has DD.2.0. I didn`t hear much difference between the two, and the picture is sharp and clear on both of them. This is truly a great release and a great movie. 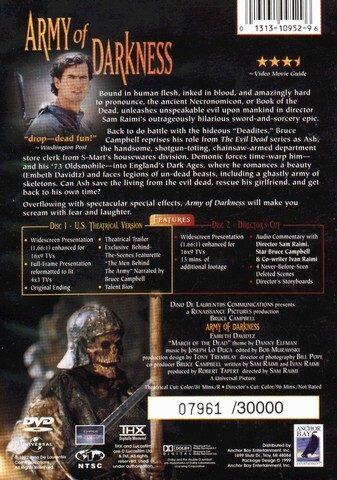 Ash is trapped in the past, and needs the Necronomicon ( book of the dead ) to get back to his own time. When he finds the book, he has to say some words before he removes the book, but he doesn`t remember the words excactly, and instead he awakens an army of the dead. The two versions of the film has different endings, but i liked the original ending on the DC best. Both versions sounds and look great, but the DC is more compleat as it runs longer. 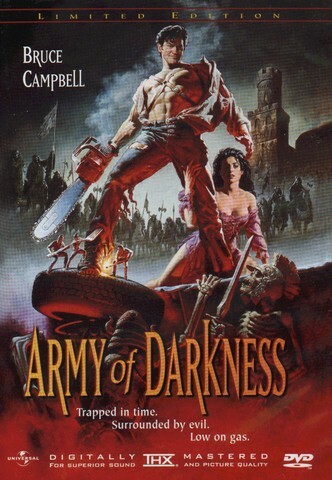 Both versions are great fun to watch.¨TRAPPED IN THE MIDDLEAGE ARMED WITH A CHAINSAW AND A BOOMSTICK!